Arctic Water Resources Vulnerability Index (AWRVI). Postdoctoral Positions Available! Contact Dr. Andy Anaru Kliskey at afadk@uaa.alaska.edu for more information. Dr. Lilian Alessa is a Co-PI and will serve as the Co-Director for a five-year research project entitled "Alaska Adapting to Changing Environments" (Alaska ACE). The $20 million award from the NSF to Alaska EPSCoR (Experimental Program to Stimulate Competitive Research) "...will conduct biological, physical and social research into the 'adaptive capacity' of Alaska communities: that is, the mechanisms that enable communities to effectively respond to environmental and social changes." A link to a detailed announcement and more information can be found here. The RAM Group is dedicated to "Big Picture" thinking, incorporating a vision that weaves the many threads of multi-disciplinary research into a cohesive and integrated framework for the Arctic. 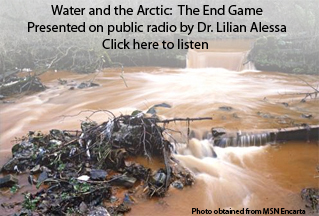 Click on the image below to hear a presentation by Dr. Lilian Alessa titled "Water and the Arctic: The End Game". The RAM group is an Alaska EPSCoR partner. Collaboration, Innovation and Inspiration.Transdisciplinary Methodogical Advancement. Relevance to the Arctic Advancement of Complex Systems and Adaptive Management Theories Maximization of Research Efficiency Between Disciplines Opportunties for Students and Faculty Collaboration with National and International Teams Products which can be applied by communities, managers, policy-makers and scientists in diverse contexts.